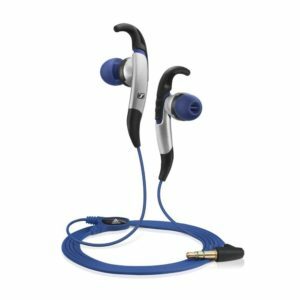 Welcome to our Best Workout Headphones guide, where we have carefully curated the best running and workout Headphones from across the web based on critic scores, user reviews and real world performance. Most love the post or pre work exercise routines that they have incorporated into their days. It acts as a kind of meditation, clearing the head of cluttered thoughts and either focusing you for the day ahead, or relieving you of the stresses from the day that just passed. 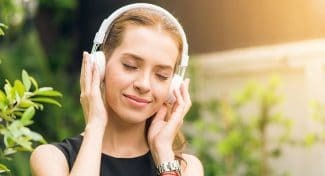 Music and workouts often go hand-in-hand, with most seeing both music and exercise as a good way of escaping their stress filled daily lives, or just finding that music can pump one’s performance up. It is often difficult finding the right kind of headphone for exercises that involves rigorous movements. The headphones we at HeadphoneNinja have selected are built for running and work out purposes, offering comfort and an ability to stay on your head when excessive sweating or movement is involved, all while delivering a solid audio performance. We hope that the following guide can offer the necessary assistance, guiding you in selecting a headphone most suited for your running and workout needs. 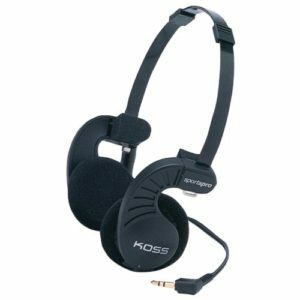 The Koss SportaPro sports headphones have been around for quite a while and are considered quite an eyesore by reviewers who seem to consider fashion over performance, but many reviews pointed out that these deliver a good overall sound performance. The bass is said to be full and it reaches a low of 5Hz, while the high frequency starts rolling off at around 25,000Hz and is said to be clean and clear. Some people did however find that it can be a bit too much at times, suggesting it gets muddy with certain genres at higher volumes. Others loved the bass however, and pointed out that they tweaked it to their individual preference. The headband is able to fold backwards at its base, changing from an overhead headphone to a back of the head style headphone. The foam cushions breathe quite nicely according to users, and do not make one’s ears hot or warm in any way. The audio quality is reportedly not reduced at all because of the breathable foam cushion. The headphones weigh in at 2.2 ounces and are fully collapsible, easily folding away into its carrying case. They also come with a lifetime warranty for those who stress about their durability. The Koss SportaPro are an incredibly affordable pair of quality sport headphones that have been around since the early 2000s. Based on their Amazon.com user score, they are still able to compete with with modern day headphones, out classing many in the price range. The Koss SportaPro sports headphones may not be the most aesthetically pleasing headphones, but their audio performance is solid and after 12 years, they are still going strong. The TaoTronics TT-BH12s are solid sports headphones that have offer an overall great performance. Their ability push out clean and clear sound while remaining firm on your head is perfect for active individuals. There is nothing worse than wearing headphones that constantly fall off due to sweat or due to a bad design. These are designed for extreme heat, excessive sweating and even jogging in light rain. We do not recommend running with these in torrential downpours, not only are they more than likely to do up some water damage, but your playback device (more than likely your mobile phone) will get ruined. They come with 5 pairs of ear tips: 2 pairs that are semi-closed, allowing you to hear external noises (handy for you jogging on busy roads) and 3 pairs of closed ear tips for noise cancellation purposes. It is said to have 8 hours of playback time on a single charge, but some users found that it can go for way longer. Their flexible ear hooks easily hook around your ears, making sure these sit firmly and snuggly when you’re engaged in exercise that involving lots of movement. One user did point out that due to the ear tips not being adjustable, it did not fit well on his head, but others users did dispute this in the comment section. The headphones also come with a nice carrying pouch for when they are not in use. Their multifunction buttons are also said to be easy to use, reducing the hassles of having to change tracks or volumes on your playback device. There were some reports of Bluetooth disconnections, but this was not enough to deter users from giving the TaoTronics TT-BH12 a solid score. 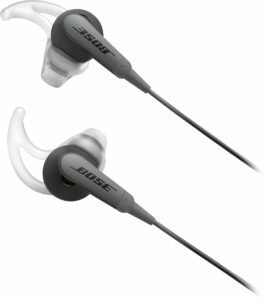 The Bose SoundSport in-ear headphones received positive reviews for their weather and sweat resistant build, their full and warm bass and their comfort, sitting effortlessly in the ears without feeling like they are jammed in. They also provide the warm sound that is associated with Bose, keeping most happy with their purchase. The price was, however, a bit high for some, with users expecting a better overall sound quality for the price and not just a good low end. The noise isolation was also very minimal, with some reporting a lot of external ambient noise disrupting their listening experience. The Bose SoundSport may be a tad expensive, but their overall comfort and lightweight build are great for active users who looking for minimal irritation from an in-ear headphone set. The Bose SoundSport keep that signature warm Bose sound with their earbuds, but it may be difficult to hear a lot of your music due to their lack of noise cancellation. The SoundSports are better suited for those who live in quiet areas. The Panasonic RP-HJE120-K sports earbuds offer a solid performance at an awesome price. There have been more than 31 000 reviews on these, showing just how much of these have been sold. Users love the sound quality, finding they deliver a clean sound that some suggested lacked bass, but others found it more than satisfactory. Their ergonomic comfort design is also a major plus, offering amazing comfort in the ears along with solid noise cancellation. The noise cancellation is apparently so effective, that one user used them in his office while there was a construction crew outside his window using a jackhammer, rendering the excessive external noise completely inaudible. It comes in eight different colors to match your playback device and comes with three different earpads for your specific ear, and as mentioned, the ErgoFit design allows the pads to easily conform to the shape of your ears. The long 3.6ft cord easily threads through your clothing into your pocket or wherever you may keep your playback device. In regards to the apparent lower bass, an audio engineer pointed out that they must be fitted in your ears properly for you to properly experience the bass, so those who did find it lacks bass may have just not worn them properly in their ears, reducing the bass significantly. For their price and the great responses that these have received from customers, we can without a doubt say that the Panasonic RP-HJE120-K is an awesome set of earbuds that deliver an awesome experience and along with their durability and ability to comfortably stay in the ears, they are great for active individuals who want to use them for running or at the gym. 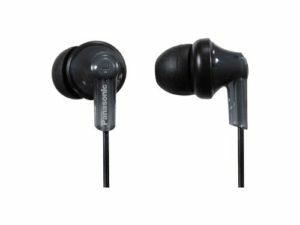 The Panasonic RP-HJE120-K earbud headphones are a great purchase, delivering great sound at a great price. They may lack some bass, but that is subjective and could be due to users not wearing them properly. The COULAX QY8 in-ear headphones offer a good overall sound with a noticeably warm and full bass. Although advertised as sports headphones, they are not as stable as most would like. The little ear clips that go around your earlobe, which supposedly provide stability, do not provide everyone the stability they are looking for. Users have reported that although they are light, they can fall out when on runs and during gym activities that require a lot of movement. This did not, however, deter most from buying them and using them for offices and/or around the house. Users loved their Bluetooth range and their ability to pair with two devices. They are also said to be comfortable in the ear and come with 3 silicone ear tips and 3 ear hooks to ensure that you find the right fit for you. They also come with a built-in microphone, allowing for a hands-free function, saving you the hassle of constantly taking the headphones out every time you receive a phone call. They offer approximately 7 hours of battery life and are said to charge fairly quickly. 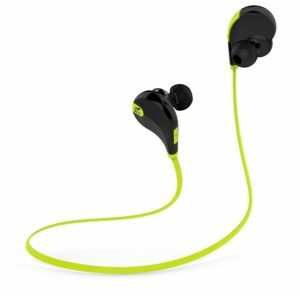 The COULAX QY8 in-ear headphones are sports headphones and do offer a sweat proof design, but you may have some issues getting them to stay in the ear when out on jogs. They are great for casual listeners who want to use them for walks or just around the house or office. The COULAX QY8 sports in-ear headphones are less ideal for sports and more suited for more casual listeners who aren’t involved in rigorous activities, such as running. 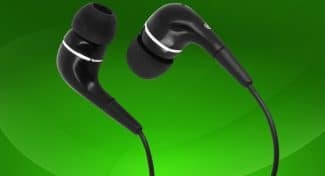 The JVC HAEBX5B sports headphones are a great budget pair of headphones that offer a great low end and a decent overall sound. Users did point out that the bass response is awesome, but the overall sound quality is nothing to write home about, suggesting it lacks the shine that higher end headphones offer. 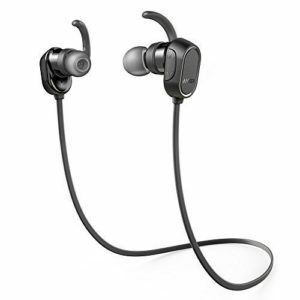 Many suggested that these are great for taking out on jogs and for gym sessions, as they comfortably stay in the ear, coming with interchangeable earpieces to fit most ears. They are also splash proof, meaning they will tolerate sweat during your heavy workouts and even a bit of rain during outdoor activities (they are not waterproof, just splash proof). Their design is sleek and unobtrusive, with some users pointing out that the 3.94ft cord does become tangled at times. The over-ear hooks are well designed and do not impose on their overall comfort too much, with users able to wear them for quite a while before they become noticeable. They do also come in different colours to match your iPod or phone and they do come with an iPhone/iPod compatible slim plug. The JVC HAEBX5B is a great budget headphone that may not offer studio grade sound quality, but it does a good job at being a reliable exercise headphone. 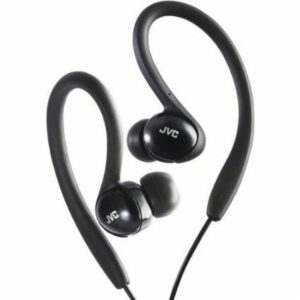 The JVC HAEBX5B headphones offer a good overall performance for the price. They are unobtrusive on the head and sit firmly during heavy workouts, delivering an okay sound performance with a noticeably rich bass. The SoundPEATS QY7 earbuds have received a ton of praise for their great fit their ability to stay on the head. 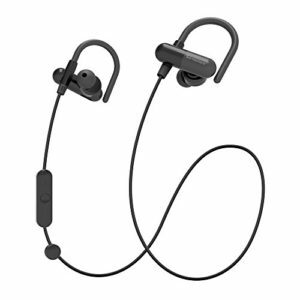 This already makes them great for active folks who are looking for earbuds that don’t need to be readjusted every 5 seconds, disrupting your workout or whatever you may be using them for at the time. They are also lightweight, weighing in at only 0.5 ounces, and along with their ergonomic design, they are sweat proof. Their sound is said to be warm and rich with a very well controlled bass that is not overwhelming in any way. 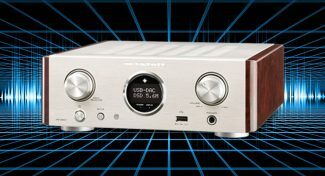 Their mids are slightly recessed, but messing around with your media players equalizer can get you a sound more suited to your taste. The high end is crisp, but not overly bright. Some brighter high ends can really feel like they are sawing into your head. They are said to charge really quickly and can play for up to 5-hours according to the description, but users noted that they actually run for up to 6-hours. They charge via a USB charging cable which is included, and come with more than enough extra cushions and hooks (6 of each to be exact). The SoundPEATS QY7 deliver a great overall performance and are incredibly affordable. They also come with a 12 month warranty. The SoundPEATS Q7 offer a solid Bluetooth range and sit well in the ear, making them great for both running type activities and more controlled activities like gymming. The Anker SoundBuds is a bestselling in-ear sports earbud that delivers a solid overall experience. It is advertised as having a 66-foot Bluetooth range, and customers have substantiated these claims. This is an impressive range, as most Bluetooth headsets are usually limited to around 33-feet. It has a roughly 8-hour battery life if played at a reasonable volume. It has a neckband design so one does not have to deal with tangling wires and the earhooks ensure a comfortable fit. One user mentioned that he did find that cable between the earbuds can get in the way when running, even with the clips in place. 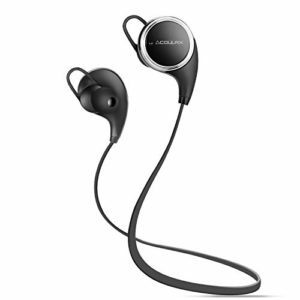 The SoundBuds are said to deliver a decent sound performance. The bass is solid and the high end is crisp and clean, however, some found the mid tones to be slightly muffled. One can always mess around with the mid frequencies on the media player’s equalizer to get it sounding just right for you. The microphone is said to be clear, with no reports of inaudible conversations. The power, pause and volume controls are well placed, allowing one to easy control your music, however, there is no button to rewind or to go back, meaning you can only skip forward through tracks. The Anker SoundBuds provide one with a good overall listening experience. The price is excellent for what you get. If you find yourself running into issues, the customer support is said to be excellent, consistently receiving praise from reviewers. The Anker SoundBuds are great in-ear sports earbuds that deliver a good overall listening experience at an excellent price. The 66-foot Bluetooth range is excellent for those who like wonder around the gym without having to carry their playback device with them. The ZipBuds SLIDE earbuds are great for testing workout conditions as they are said to be durable and they come with a lifetime guarantee. They make use of military grade bulletproof fibres, which is why these are said to be so durable. These are wired and not Bluetooth, but their wiring is completely tangle free due to their tangle free technology. They are sweat proof and weatherproof and sit comfortably in the ear even when one is sweating excessively. They have a great design and a great selection of colors. They are said to deliver a solid overall sound quality, with some users not liking the low end, suggesting there is too much bass. Other users liked the bass, suggesting the overall sound quality was awesome and the bass added that extra warmth. 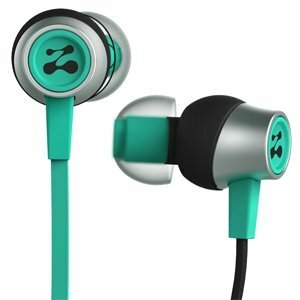 The fact that they come with 3 different ear tips means that you can find a pair that best fits your ears, allowing these lightweight earbuds to comfortably sit in your ear without them displacing during your sweaty workouts. One user had some trouble with customer service, suggesting he struggled with getting them to replace his faulty pair, expressing his overall annoyance with them. It is difficult to assess whether this is the case with everyone because no one else has come forward to suggest needing a replacement. The Zipbuds SLIDE are excellent for sports people who are looking for a pair of headphones that they can push equally as hard as they push themselves during their workout should look no further. Sennheiser are known for delivering good quality headphones. The CX 685s have received quite a bit of mixed reviews. Some users loved their sound quality, saying they delivered crisp highs and a decent low end, while others found that their low end was lacking and would have liked more bass. It would all be up to what you prefer, however. 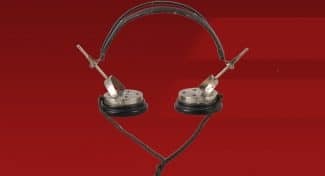 Some love Sennheisers sound and biased opinions can creep into reviews. Users found that although these are really comfortable, they can slip out of your ears when there is excessive sweating (yes, they are sweat proof) involved , making them less ideal for activities that involve bouncing around such as running, and better for the gym. 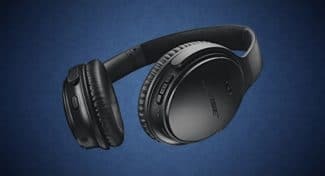 Their noise cancellation has been praised, with users saying they are so effective at cancelling out ambient noise that they have to completely remove them from their ears in order to hear someone speak. Many have really been impressed with their durability, pointing out that they have really lasted through a lot of strenuous activities that have tested the headphones, pointing out that they are still going strong 2 years on. The box comes with a storage pouch, an additional ear adaptor set, a cleaning tool and a cable clip. The frequency response said to reach a low of 18 Hz and a high of 20, 000 Hz. If you are a staunch Sennheiser fan, then the CX 685s are worth investing in. They are well priced for the quality that they deliver, but one should bear in mind that, depending on your ear shape, these may not be suitable for runners.